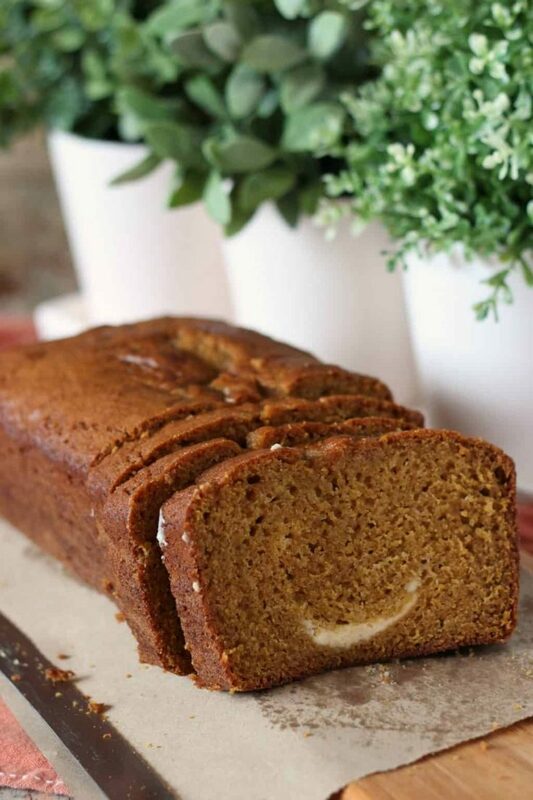 Pumpkin Bread with Cream Cheese Swirl is your go-to quick bread for autumn baking. Easy to pull together and even easier to eat, this pumpkin bread is a seasonal favorite. Pumpkins are creeping back into the baking scene as autumn draws near. Today the #BreadBakers are sharing our favorite pumpkin recipes with you so grab your pumpkin spiced latte and have a look at some beautiful pumpkin recipes! Here is an easy quick bread recipe from Williams-Sonoma’s website with the addition of a cream cheese swirl. My swirl looks more like a “smile” than a “swirl” but the idea is the same no matter how artistic your cream cheese swirl looks. I made a second round of this quick bread without the cream cheese and, I must say, I liked it even better. The bread traveled well and stayed moist as we enjoyed it over the weekend on a girls’ trip to the mountains. 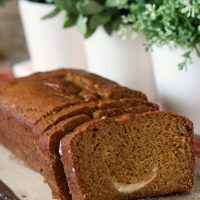 Pumpkin Bread with Cream Cheese Swirl is your go-to quick bread for autumn baking. 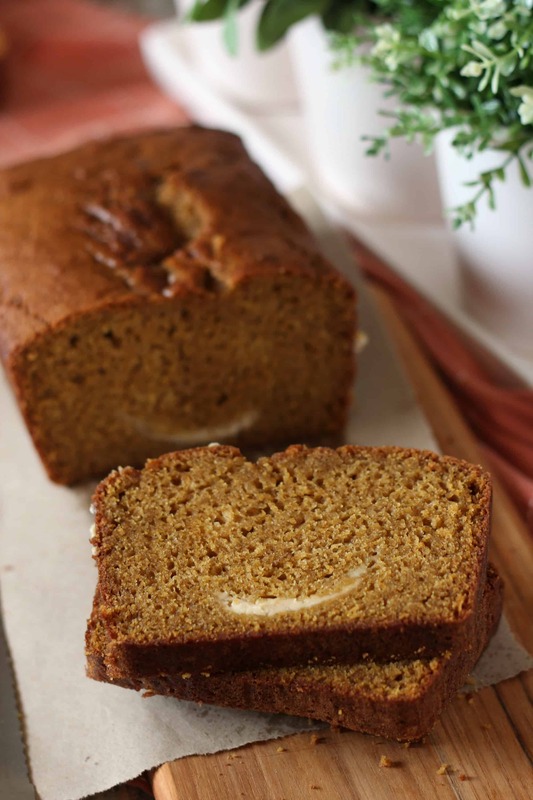 Easy to pull together and even easier to eat, this pumpkin bread is a seasonal favorite. Prepare a bread loaf pan with baking spray; line with parchment. Mix the dry ingredients: flour, baking powder, baking soda, salt and all the spices. Stir gently with a whisk. In a separate bowl beat the butter with the brown sugar and the granulated sugar. Add the eggs one at a time then stir in the pumpkin puree. Add the wet ingredients to the dry ingredients and stir until barely incorporated. In another small bowl prepare the cream cheese mixture: beat the softened cream cheese with the sugar and vanilla. Pour two thirds of the bread batter into the prepared loaf pan. Spoon the cream cheese mixture on top of the batter, spread gently. Top with the remaining bread batter. Swirl with a knife. Bake in the oven for 50-55 minutes. Cool on a wire rack. I used the referenced recipe but omitted the orange flavors. I also added the cream cheese swirl. What a variety of recipes were made this month! Enjoy! We take turns hosting each month and choosing the theme/ingredient. 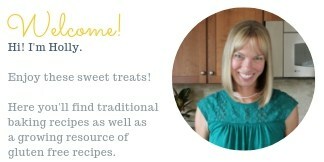 Many thanks to Kylee of Kylee Cooks for hosting this month. I think I will make mine sans cream cheese….who needs the extra calories if it doesn’t improve the loaf. What a moist and delicious looking pumpkin bread. I’m loving your ‘smiling’ bread. It’s always nice when our food shares a smile with us, right? 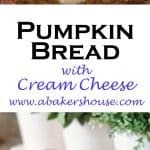 I must admit that I am not as pumpkin crazy as some, but I do love pumpkin bread and my favorite that pumpkin cream cheese roll. This looks like something that I would really enjoy with a cup of coffee on a cold day. Yes, Karen, that pumpkin roll cake is STILL on my list of things to bake. Maybe this year! Nothing better than pumpkin and cream cheese. I love that you described the swirl as a “smile”! You are right– cream cheese and pumpkin is a great combo. Yummy – I would definitely eat this for breakfast! It looks so rich and moist! Thanks, Amy, it was enjoyed for breakfast and afternoon snacks too. Nice baking with you this month! Love the cream cheese smile on the pumpkin bread slice, looks gorgeous. Thanks, it is always a surprise how a swirl might turn out after baking! I’ve yet to try pumpkin and cream cheese together. Your bread is certainly tempting me to try out the recipe. Looks so moist and tempting. wonderful swirl of cream cheese , it resembles the smile sign………. Pumpkin with cream cheese has always been a favorite of mine!